After living and working in London for over a decade, I made the decision to ditch taking the tube and so learnt to ride a motorbike. I was fed up of relying on public transport, even in a city that boasts one of the best services. I wanted to save time, save stress and hopefully save some money. I figured a motorcycle would be ideal for commuting and for pleasure. This blog tracks my progress over the years and what I have learnt along the way. I may not be a beginner anymore, but I hope you will still find it interesting and useful when planning your own motorcycle adventures. 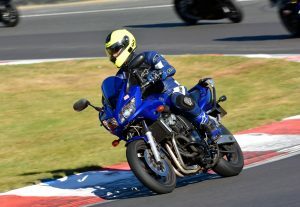 Whether you’re just considering jumping on two wheels, a novice rider or have more experience; I would love to hear from you and share what you have learnt. This is Peabody my first bike, complete with Fatty the cat. I began riding my own bike at the age of 17 on the pictured Yamaha YB100. Riding a motorbike is a fun and addictive- and twenty-odd years later I am still riding! I ride to work and ride for pleasure, especially with The Curvy Riders, a national biker group for women. I offer a female perspective on products for bikers and on motorcycling issues. Hey! Just checked out the site and it’s great! Thanks for plugging MAPPED! Looking forward to our next ride! Maybe a ride to Ace Cafe? ?….speak soon! Couldn’t agree more. Bike rule ! I mean BIKES RULE ! I was just searching for motorcycling tips as I’m a new rider and came across your website, which in really enjoyed. 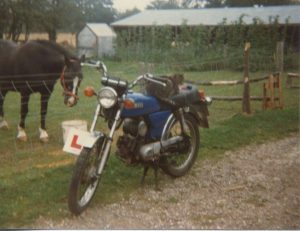 A little bit about me – I first started on 2 wheels when I used to go to university in Central London about 13 years and got fed up of the underground. I got a little twist-and-go Vespa that that served me well for 2 years….. I started using the moped for more than just uni runs and soon had the hankering for something bit more powerful. So I sat my test but then due to a change in circumstances I never got my first ‘big bike’. Until now that is….. Back to using the underground and a 2 hour commute, I didn’t last more than a couple of months! So finally got went and got myself an R6 and after familiarising myself on the local road and refreshing my skills I have just started using it to go to and from work. I really love the bike but I’m not enjoying the ride but that’s because Im a total beginner and still learning and that’s what lead me to your site. I figure that once I’ve racked up a decent number of riding hours I’ll start to relax more and start enjoying the ride. On my first day commuting it took me 1 hour 45 to get from Barking to Chiswick on the A406! I just wanted to throw down the bike and walk away. I wished I’d never got it in the first place! I’m riding like I’m a car, my filtering is terrible so I’m always stop start and therefore my clutch hand is killing me!! I didn’t take the bike today as there was a snow warning (thank god!) and my wrists could do with a rest! I was just wondering whether you went through a similar thing when you first started out? Also intersted to know what do you ride? And How long did it take you to become competent from a beginner and start enjoying taking the bike out? Glad to hear you’re back on a bike again. I ride a Yamaha Fazer 600, not a million miles away from your R6, but not quite as sporty. It’s perfectly normal to not feel comfortable filtering when starting out. Nothing wrong with that and you should be wary of riding too far out of your comfort zone – that’s when mistakes happen. Take it easy and build up your confidence in your own time. It took me many months before I felt comfortable filtering in London. Along the way, I made a few newbie mistakes and still have much to learn and perfect. Keep practising, let the faster bikers past, don’t ride beyond your confidence level or try to emulate faster riders, not all will be good role models. Consider doing a Bike Safe day or other advanced training – they really do teach you a lot. The A406 is often hairy and full of boy racers (who will try to compete with you on a fast sports bike). Try other routes, e.g. through centre (A13, Limehouse Link, Highway, Embankment etc). The sporty riding position on an R6 can be challenging. Grip the tank with legs, relax and lower your elbows, balls of feet on pegs and try to support your body from your waist. Your steering will be better, easier and less strain on your wrists. For very low speed riding, you should aim to keep clutch/throttle static and fine tune speed with rear brake (how I’ve been taught on IAM course).